FEELING GOOD ... Jonas Gutierrez. JOHN Carver says Jonas Gutierrez is back to his old self – and his decision to restore the winger to Newcastle United’s matchday squad is purely a football one. Gutierrez is set to make an emotional return to first-team action tomorrow as Newcastle United take on Aston Villa at St James’s Park. The 31-year-old is “almost certain” to be named on the bench, and it will be his first involvement with the senior team since beating testicular cancer last year. Carver said earlier this week that Gutierrez was not ready for a return to action, while the Argentina international suggested it was a “board decision” as to whether he would make a comeback, with suggestions he is just eight appearances away from triggering a contract extension. However, Carver insists the decision is his and his alone, and after impressing in training, Gutierrez will now be brought back into the fold. Carver said: “He’s had another good week, Tuesday and particularly yesterday, so he’s in the squad and will almost certainly be on the bench. “I know all the rumours have been out there about whether it’s Mike (Ashley’s) or Lee (Charnley’s) decision, but let me tell you, and let me put the record straight, I’ve had no conversations with either of them about Jonas, because I’m the one who picks the team. “I don’t know why (Jonas) said what he did, but we’ve had the conversation now and I’ve put the record straight. “I will be the one who decides if he is ready for it, and he is ready to go on the bench now. “Me and Steve Stone spoke about him on Monday and the time being right for him to return now. Since Gutierrez returned to training last November, there have been suggestions Newcastle might offer him one last appearance as a farewell to the fans. However, Carver is insistent that there is no sentiment at play, and Gutierrez still has plenty to offer United between now and the end of the season. He added: “It’s totally a football decision. Yesterday, more than any other, I have seen the old Jonas Gutierrez. “I’ve been asked whether he might get a swansong before the end of the season, but I have never even been thinking about a swansong. “Why would it be a swansong? I just want to make a football decision, and that is that it’s right to put him on the bench. “If I need to put him on the pitch then I will. “Over the weeks he has got fitter and stronger. “Yesterday, more than any other, I have seen the old Jonas Gutierrez. 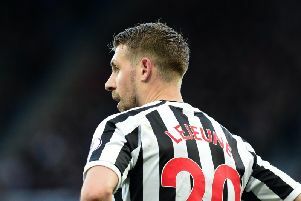 Carver – who sees Gutierrez as cover across the midfield and in the full-back positions – expects the popular Argentinian’s return to action to produce a “feelgood” factor at St James’s Park tomorrow. He said: “Listen, I’m telling you now, when we announce the team at the weekend and our fans hear that Jonas is on the bench, can you imagine the feeling in the stadium?